Each month, the incarcerated men in our program work together to create a newsletter about their experience in PEP. Here is the third “PEP Chronicle” from Class #Transcendent 22! “Where are they now” …. a feature on two recently released graduates. Our amazing friend Genie Erneta from TGS has been a loyal volunteer and donor to the Prison Entrepreneurship Program for many years. As a member of our Houston Advisory Board, she has challenged us to think more strategically about our expansion while continuing to encourage our growth. She also has an incredible knack for inspiring her peers to deepen their own support for PEP! Others soon followed her lead by offering to sponsor future events. Thank you, Genie, for all that you do for PEP! If you would like to learn why Genie is such a big fan of this event, go to http://peprsvp.org/ and register to join us! On Friday, September 21, 2012, over 50 executives joined us for our “Excellence in Etiquette” event at the Cleveland Correctional Center. Led by international etiquette guru and author Colleen Rickenbacher, our executives and participants were able to learn the finer points of professional and personal etiquette. Many business deals are lost or won in the first few minutes of meeting a person. Prospective employers can know a great deal about an applicant before they even enter the interview room. More than simply learning to “mind their manners,” our participants learned the art of etiquette from the boardroom to the dining room. Check out our photos from the exquisite meal that we shared in the PEP Chow Hall and the lively conversation that we had afterwards! Back by popular demand, entrepreneur and author Colleen A. Rickenbacher — a.k.a. “The Necktie Assassin!” — is returning to prison to teach business etiquette to Class 18 of the Prison Entrepreneurship Program! She then returns to speak during our “Excellence in Etiquette” event within the Cleveland unit on Friday, September 21, 2012 from 11:30 – 5:00 p.m. ! Register today at http://www.pep.org/rsvp/. Colleen has given presentations on the importance of protocol and etiquette in your professional and personal life to leaders all over the world. She can be seen and heard regularly on national television and radio, and was recognized by Meeting News Magazine as One of the Top 25 Most Influential People in the Meetings Industry. Colleen was also recently inducted into the Hall of Fame and awarded the Lifetime Achievement designation by Texas Meetings & Events magazine, which is their highest honor. Her book Be On Your Best Business Behavior covers all areas of practical business and dining skills. The tips she provides will strengthen your image and provide the necessary guidelines to you and your organization. It is never too early or too late to learn skills that will separate you from your competition. No matter where you are in your career, you never want to leave money on the table because you did not have the proper business and protocol skills to close the deal or to retain your important clients and customers. 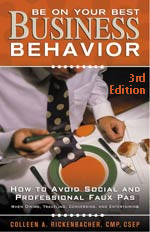 Be On Your Best Cultural Behavior covers the proper etiquette and protocol in 33 countries. These guidelines will allow you to navigate globally in our international climate whether you do business in other countries or never leave your backyard. 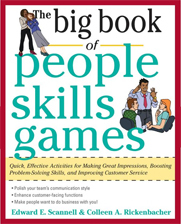 Her latest book with co-author Edward Scannell is The Big Book of People Skills Game (McGraw-Hill). These quick and effective activities are designed for making great impressions, boosting problem-solving skills and improving customer service. Colleen has achieved her Certified Meeting Professional (CMP), the Certified Special Events Professional (CSEP), her Certified Protocol Consultant (CPC), and most recently her Certified Tourism Ambassador (CTA). Join us on September 21, 2012 to meet Colleen and learn how YOU can be on YOUR best business behavior! PEP is still buzzing from the inspiration recently provided to our Class 17 participants by international speaker, author and etiquette guru Colleen A. Rickenbacher, CMP, CSEP, CPC, CTA. Mrs. Rickenbacher — a.k.a. “Necktie Assassin”! — developed the curriculum that we now present in the prison for our business and professional etiquette course. She also was able to join us for Class 17’s “Excellence in Etiquette” event (click link for pictures). Thank you, Colleen, for all that you do for PEP! We are very grateful to Colleen for helping us at this event. 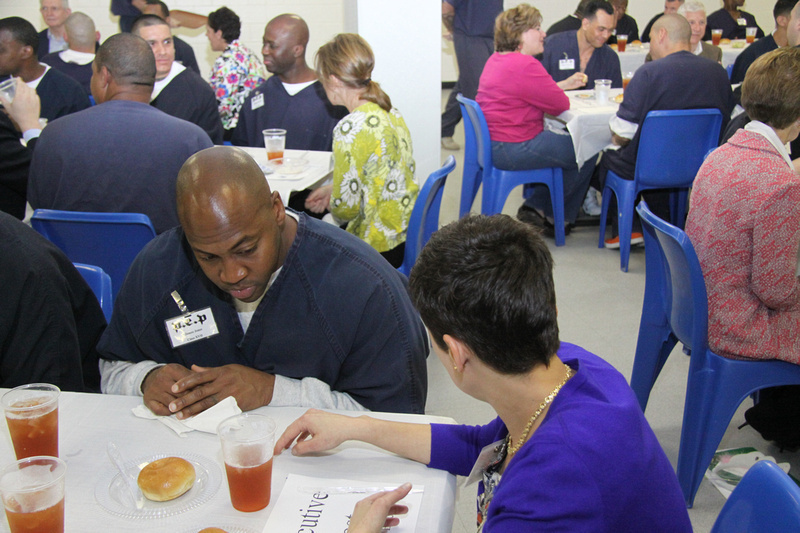 As you can see from the pictures, our participants and our volunteer executives all had a wonderful time practicing exceptional etiquette … at lunch in prison! Below are a few images, but click here to see all of the pictures from the event. We are very excited to announce that PEP Class 17’s etiquette program will be taught by entrepreneur and author Colleen A. Rickenbacher, CMP, CSEP, CPC, CTA! Check out her site at http://www.colleenrickenbacher.com/. Best of all — you can hear Colleen speak during our “Excellence in Etiquette” event within the Cleveland unit on Friday, March 23, 2012 from 11:30 – 5:00 p.m. ! Register today at http://www.pep.org/rsvp/. Speaking engagements on the importance of protocol and etiquette in your professional and personal life have taken Colleen around the world. She can be seen and heard regularly on national television and radio. Colleen was recognized by Meeting News Magazine as One of the Top 25 Most Influential People in the Meetings Industry. Most recently she was inducted into the Hall of Fame and awarded the Lifetime Achievement designation by Texas Meetings & Events magazine, which is their highest honor. Join us on March 23, 2012 to meet Colleen and learn how YOU can be on YOUR best business behavior!